In order to get the best results from the use of your Black Knight filter brushes, it is important first to consider their priority function. If you are using them as a pre-filter to remove the bulk of the coarse waste, a system of single interlocked hanging brushes is best. If you want to trap an even greater proportion of the waste, the brushes need to be either vertically or horizontally double interlocked (see System Layouts). When a significant amount of waste has built up on the brushes, it should be flushed away. If there is a drain in the bottom of the filter chamber then stop the inflow of pond water and drain the chamber completely. When it is empty, the brushes and the chamber should be flushed using buckets of pond water. When the filter is clean, the drain can be closed and filtration can resume. Cleaning in this way will retain most of the beneficial bacteria that live on the brushes but the rotting waste is removed and cannot do any more harm to the water quality. If there is a more persistent accumulation on the first lines of brushes then these can simply be taken out, hosed down and put back. The chlorinated water from the hosepipe will kill some of the beneficial bacteria on those brushes but the primary function of the first brushes is mechanical filtration and therefore any contribution they make to the biological effort should be regarded as a bonus. 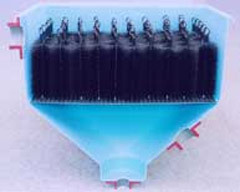 When brushes are used for biological filtration, it is important to remember that a biological colony will function only when six to eight weeks have elapsed after the system is commissioned. It takes this amount of time for the bacteria to reach full strength. Once your system is running efficiently, it is important that the pump is never switched off for more than a few hours at a time otherwise the biological colony will begin to die. The same will happen if the filter materials are allowed to dry out. Do not expect your water to be clear until your filter has been running for at least eight weeks. After this time, an ultra violet steriliser can be used if necessary to limit the growth of unicellular algae (the type which causes green water), but most ponds will clear naturally. 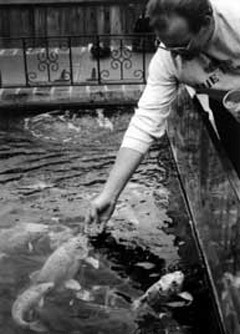 The water should be tested for ammonia and nitrite on a regular basis to ensure that good quality water conditions are maintained for the fish. If a reading is persistently evident on either or both of these tests then it is likely that the pond is overstocked for the size of filter you are using. The only long term solutions to this are to increase the size of the filtration system or reduce the pond stocking level.